+ Phakic Implant : eye operation without laser ! The phakic implant makes it possible to treat some of the eye anomalies, such as strong myopia which cannot be treated by a laser. 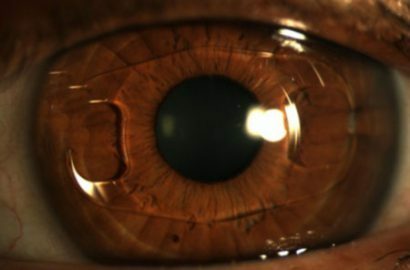 A small artificial corrective lens, known as the “phakic implant”, is inserted inside the eye to correct the patient’s vision. This implant is introduced into the anterior part of the eye without operating on the lens. The phakic implant will function exactly like a contact lens, the difference is that the implant is placed within the eye, in front of or behind the pupil. This procedure is recommended before age 50.
recover sufficient vision without glasses or lenses. when the visual defect is important and can not be treated with LASIK: in the case of myopia between – 8 and – 24 diopters, hyperopia more than 4 diopters, astigmatism important. Both eyes cannot be operated at the same time but the second eye only after a few days. Annual regular monitoring is recommended for as long as the implant is in the eye. It needs to be pointed out that the operation does not stop the natural evolution of myopia or treated hypermetropia or astigmatism. Any anomaly must be stable before the operation can be undertaken so as to avoid the risk of seeing it appearing partially after the operation. A myopic eye remains fragile. Thus the patients must ensure continuous monitoring of their eyes. Rigorous monitoring and a clinical examination by an ophthalmologist is essential to make sure that the implant is well tolerated in the very long term. We advise a checkup once every 6 months for as long as the implant is inside the eye. Visual acuity will be improved but will not be better than the vision you had with glasses or lenses before the operation. The final visual result will be final and stable only after a few weeks. No regression of the effect obtained has been noted to date. Glasses may have to be worn occasionally after the operation as the implant may be over- or under-correcting but the glasses to be worm will be much thinner and will be useful only in specific situation where a precise vision is necessary. Presbyopia will not be corrected through this operation. Glasses will thus be necessary for near vision after approx. the age of 45. The phakic implant will work exactly like contact lenses. 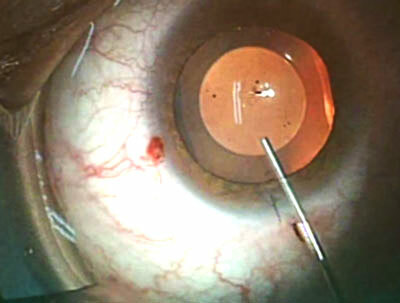 The difference is that the implant is placed inside the eye, in front or behind the pupil. This operation is advisable before the age of 50.
to obtain a sufficiently good vision without having to wear glasses or lenses. when the visual defect is quite considerable and cannot be treated with LASIK: and in case of myopia between -8 and -24 dioptres, hypermetropia beyond 4 dioptres and when there is considerable astigmatism. It is advisable to bring your glasses with you and the references for your lenses. Your sight will improve immediately and will continue to improve in the following weeks before it stabilizes. There may be some redness or irritation after the operation which will disappear after a few hours. You are strongly advised not to rub the operated eye for the first few weeks after the operation. The surgeon’s advice is to be followed in all cases. You can go back to work after two days and sports activities can be resumed after one week. Please do not hesitate to consult your surgeon if you have any questions. Send us your message! + What are the risks ? The implant is designed to stay in the eye permanently. It can however be removed in exceptional cases of not being well tolerated. Phakic implant surgery, just like any other surgery, is not without its risks and even if the risks are low, benign or serious complications are still possible. An infection is not impossible ( 1 case out of 1000) .In such an event particular care measures will be necessary, such as repositioning or the removal of the implant. Screening and a regular and prolonged post-operational monitoring is thus indispensible.